Criminals are fooling people in our area to the tune of thousands of dollars. 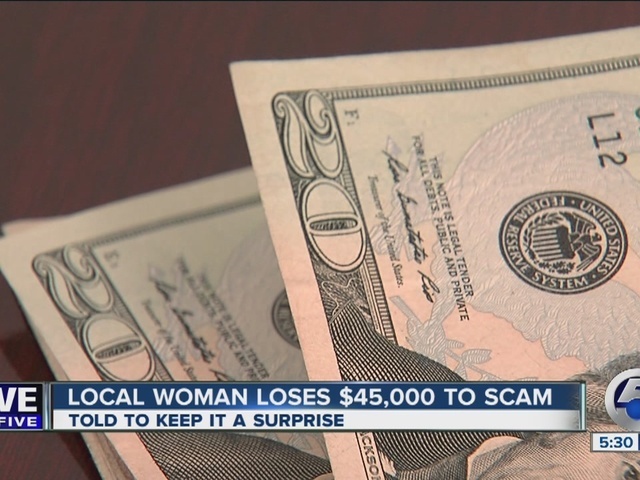 In fact, one local woman has now lost her life savings. The senior citizen from Wayne County didn't want to be identified, but thought she had won millions from Publishers Clearing House. "My mom is completely devastated, absolutely humiliated," said the victim’s daughter. The criminals told her she couldn't tell anyone because it would ruin the surprise. She was instructed to wire $900 through Western Union. The victim was told that she should say she was sending the money to a family member. She was also told that a vast majority of lottery winners are broke after five years of receiving the money so she needed to know what it feels like to be broke. When the victim grew weary of wiring money to Jamaica, they told her to overnight books with cash. She picked up books at Goodwill. One was ironically titled "The Millionaires." "She would just put the whole amount inside the book, tape the book up and then put it in a box and send it. She sent $20,000 that way,” the daughter explained. She sent three books to Pompano Beach, Fla. There is a house there, but the name on the package comes back to a man who lives just around the corner. "At this point we're just really frustrated. We feel really helpless,” added the victim’s daughter. They're frustrated because they have filed reports with the Wayne County Sheriff's Department and the FBI. So far, no updates on any progress or even if an officer has stopped by the Florida address where big-time money was sent. Meanwhile, despite their devastation the victim and her daughter had the strength to talk to newsnet5.com. "I would like to try to prevent this from happening to anybody else,” said the daughter. The Wayne County Sheriff's Department said often times there will be a forwarding address if packages of money are sent inside the U.S and the person at that address may not even know he or she is being used.